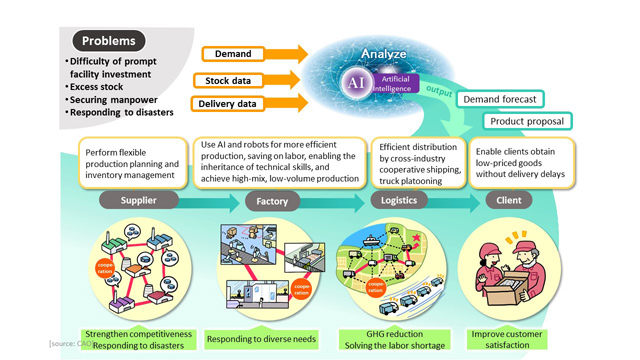 In Society 5.0, new value can be generated in the following ways: through AI analysis of big data spanning diverse types of information, including customer and consumer demand, supplier inventory information, and delivery information, and the following will be realized. ・Make distribution more efficient by cross-industry cooperative shipping, truck platooning, etc. Furthermore, for society on the whole, these solutions can help strengthen industrial competitiveness, enhance responsiveness to disasters, mitigate the labor-shortage problem, deal with diverse needs, reduce GHG emissions and expenses, improve customer satisfaction, and stimulate consumption.